Shag Carpets Area Rugs - They're Back! Chandeliers Are Not Just For Dining Rooms Anymore! Looking for a NEW look for your walls? Do you enjoy the soft look of blended colours? 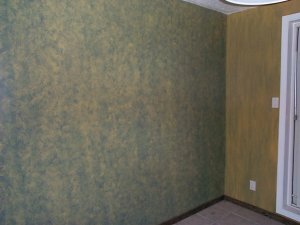 Are your walls textured and you want an easy way to update their colour? Then the faux finish, colour washing, may be for you. Here are some examples that may help you get inspired. 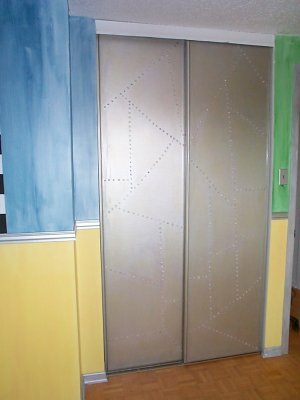 There are various ways to do do this faux finish, color washing. Colour washing can be done with several colours, with a paintbrush, rags or sponges. You may use paint which is either mixed with glaze, water or not mixed at all...and is applied as pure paint. 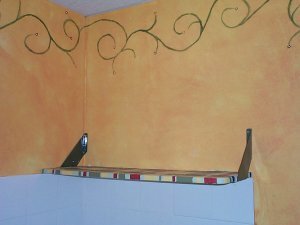 Photo on left: Bright, cheery and sunny laundry room - even if it is in a basement colour washing with rags, paint (no water or glaze), plus freehand vines and flowers. You may not mind doing laundry ever again in this very cheerful and sunshine filled laundry room - done with faux finish, color washing technique. Dramatic Duo - great for any room where you want a dramatic impact wall colour washing with rags and paintbrush, paint and water. 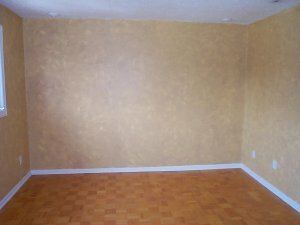 I am not only the Designer/Decorator of these colour washed walls but I have done all of the work too. Unlike some Interior Designers, I actually do most of my own work. The above examples are no exception. They were all designed, developed and painted by me, Shelly Whitney.